We’re just more than halfway through all 52 of DC’s relaunched titles, and with only two true stinkers this week, my “safe” pull list is now in the double digits. I’m enjoying a large number of these comics, and while I look forward to the point where my list becomes a little more manageable and I don’t have to kill myself to review issues in a semi-timely manner, I think it’s going to take a lot longer than I might have hoped for the plan to play out. I’m keeping a lot of books. 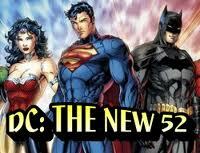 Early reports from retailers are that DC’s New 52 reboot has been a phenomenal success. It brought me back to comics after 7 years of not paying attention to them, and now I’m headed to the shop every Wednesday and I’m going to end up keeping at least half of the books on my pull list several months from now. Speaking from the perspective of a lapsed reader returning to the fold, I’d say this relaunch was a smashing success. They are certainly making a lot of money off me! With stunning, gorgeous art, a cool villain, and a touch of genuine diversity, Batwoman #1 is my Book of the Week. Even the lettering in this comic works to add fluidity and rhythm to the dialogue, and I’m interested in nearly every aspect of the story. If you get only one Week 2 book, this is the one to grab. If Williams can keep his production up, I think this has the makings of a fabled run that will be remembered for a long time to come. Although my mind reels at the historical stories opened up by the Dark Ages framework of Demon Knights #1, my award for Most Interesting book this week goes to Frankenstein: Agent of S.H.A.D.E. #1. From a headquarters stuffed into a three-inch-diameter flying sphere populated by microscopic super-scientists to a cast of characters that riffs on every type of classic monster movie, this book shoots out “big ideas” in rapid succession. It’s drawn in a distinctive style that fits the subject matter perfectly. Part of the goal of the reboot was to do something thematically new and different, and in this respect Franknstein really delivers. Most Disappointing this week goes to Mister Terrific #1. Long a mainstay of the Justice Society of America, this was Mister Terrific’s first chance to step out from the shadow of his legendary team and anchor a solo book. It was also a chance for DC to establish a strong black leading man for their diverse new era. Instead it was a pedestrian superhero comic with muddled storytelling, bad plotting, ugly art, and a ham-handed treatment of race and gender issues. With absolutely zero callbacks to past continuity and a succinct summary of the main character’s powers and personality, I’m giving Ressurection Man #1 the award for Best Reboot this week. I knew nothing about the character’s previous adventures, and left a single issue feeling like I understood him. Dan Abnett and Andy Lanning establish a long-running conflict in the battle between Heaven and Hell for the soul of the Resurrection Man that could fuel the entire series, and in doing so produce the best entry point of the entire week. I’m calling it right here. Resurrection Man is going to be a sleeper hit of the relaunch, and this issue alone will generate enormous interest in the character’s series from the 1990s. Getting the character’s original writers back for the relaunch was a stroke of genius. Here’s how the Week 2 books stack up relative to their safety level on my comics pull list. I’m going to give all 52 titles at least two issues to grab me, so I won’t be dropping titles for another three weeks.